Bobalania was formed on May 25th 2006 by Bobbie Bailey. We then became a democratic republic on the 30th of may 2006.On the 2nd of June 2006 we created our flag (go to the flag page to see our flag).Also on the same day we created our coat of arms (which can be found on the coat of arms page).We then claimed my bedroom as the embassy (and official country) of bobalania.We then had many new citizens join our country and then claimed the whole of "The Bailey family's house" as Bobalania. Since then we have had alot of new citizens join D.R.O.B. and we have reached our 100th CITIZEN! We also have a new coat of arms,and we are starting to isuue passports. 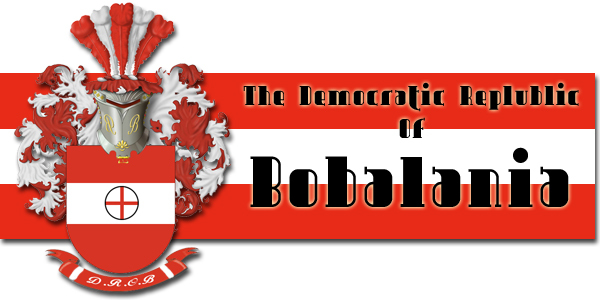 We also merged the micronation Polari into Bobalania. We have yet to make laws,declaring independence etc. We are trying to establish relations with various other nations.